Sai enumerated that the transition to IFRS for Indian Companies would take place in four phases; for the general corporates in India the compliant financial year starts from 2016-17, whereas for other corporates, Banks and Insurance and other NBFCs by 2018-19. Under phase I of the IFRS transition, all the listed companies with assets of INR 500 Crore will be required to comply with the new provisions. So, we will get to see first IFRS compliant financial statement after June 30, 2016 when the first quarter results are prepared by corporates. In order to do this corporates will also have to show their corresponding 2015 restated as per new IFRS code. This may have implications. Some companies have already restated their financial statements in line with IFRS requirements. Two such companies whose financials as per new standards already in public domain are Marico Industries and Hindustan Unilever Ltd. As per the new standards financial instruments are going to get recognized at fair value. In other words, substance over form takes precedence. For example, take the case of preference shares. They have hitherto been recognized as shares and treated accordingly, however, the new standards demand that this be treated as a debt. Accordingly, various ratios including debt-equity ratio, interest coverage ratio will change when companies start reporting their financials as per IFRS. The new standard will transition from rule based to principal based, hence it leaves room for judgement. At least one thing is definitely going to change and that is the volume of information as per the new standards. One case worth mentioning is of Royal Mail of UK, which refused to deliver companies annual reports as they had become bulkier-something running into 300 pages. Key transactions that will get affected in the new paradigm of accounting convention are Acquisitions – where minority holdings with payment obligations may be presented as financial liabilities. Goodwill on business combinations will not be permitted to be amortized, however, it will have to be tested for impairment annually. Goodwill gets better defined in the new accounting standard. Share based payments will see different treatments under the new standard. In court driven acquisitions, multiple options will be available. Even private equity transactions that have some form of promised payments will be treated as obligations, hence, these transactions will change various ratios of corporates. Subsidiaries may not be consolidated anymore if there is joint control along with private equity. Every derivatives will have to be carried at fair value and will have to be marked to market, hence this will make the financials very volatile from quarter to quarter unless hedge accounting is used. There are situations where simple payment obligations in the nature of promise look like embedded lease, hence, going forward they will have to be treated as such. FMCG and Pharma companies often get into contract to receive products from other entities and promise payments for quite a long time in futures. Under the new provisions, these companies will be required to treat such contracts as lease, hence it will affect their earnings. Many steel companies have captive power plants built in their factory premises solely to cater to their power requirement. Till date, the power companies used to reflect these assets on their balance sheets; however, now the beneficiary company – steel industries, will have to treat these plants as lease on their balance sheets. Long term foreign currency loans taken after March 2016 will affect the profit and loss account. Stock option fair value and exercise price gets counted as compensation cost. Build Operate Transfer (BOT) will now be an intangible asset as it reflects right to collect payments. Demerger, hitherto a tax neutral transaction, may become tax heavy under the new schemes when fair value concept is used. This may entail payment of minimum alternate tax (MAT). In this regards representations have been made to CBDT. New norms require disclosure on balance sheet Credit quality, rating, liquidity financial instruments, segment reporting and management view. What can you expect as a result of the new changes coming into effect? Companies have started implementing changes and engaging with investors and analysts. Some companies are putting number in public domain, viz. Marico Industries and Hindustan Unilever Ltd. Fresh Forex liabilities cannot be capitalised. Amortisation of brand not allowed in India. Cases in which Asset has indefinite life – not infinite life, India will be required to do annual impairment testing. As part of question and answer Sai also discussed case of Maruti-Suzuki which looks like a cost plus arrangement, however, much needs to be seen how Maruti treats this arrangement. Some regulatory gaps still existing in India, even after adoption of IFRS, were also discussed. The program ended with vote of thanks by Anil Ghelani, CFA. 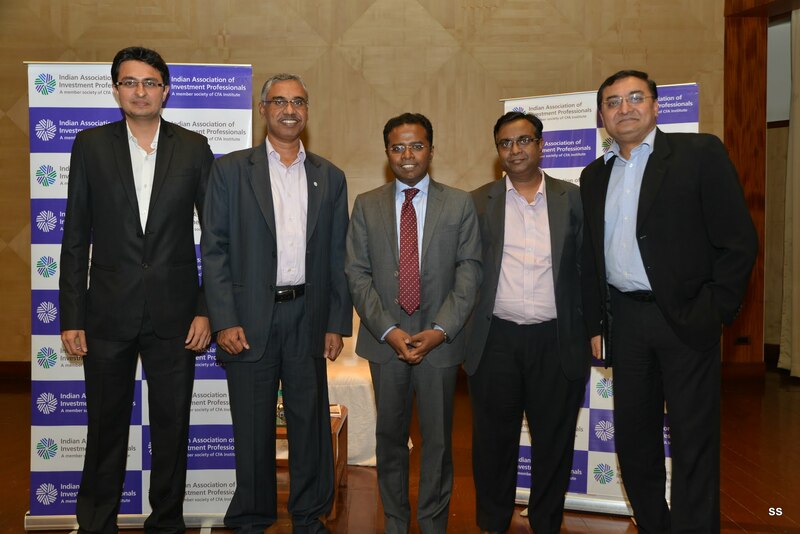 This entry was posted in Events, Mumbai, Speaker Events and tagged Anil Ghelani CFA, CII, Hindustan Unilever Ltd, IFRS, Jainendra Shandilya CFA, Jayesh Gandhi CFA, KPMG India, Madhusudan Subramanian, Marico Industries, Sai Venkateshwaran, Shreenivas Kunte CFA, Vidhu Shekhar CFA. Bookmark the permalink.